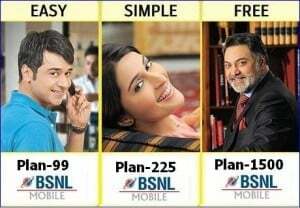 India’s National Telecom Backbone Bharat Sanchar Nigam Ltd (BSNL) today rationalized the various Postpaid plans under its 2G and 3G mobile services and added more free calls, SMS and Data credits to selected plans. The new plans will be effective from 1st Janurary 2011. BSNL has exciting range of 2G and 3G Postpaid Tariff plans starting from Rs.99/month. The revised plans are Plan-99, Plan-175, Plan-225, Plan-325, Plan-525, Plan-725 and Plan-1500. The Plan 1500 offers Unlimited Free B2B Local, STD and Roaming calls , lowest Local Off net calls as low as 20p, Off Net STD Calls as low as 30p, SMS and GPRS/3G tariff. With the new revamped wide range of postpaid plans, BSNL subscriber will get more freebies on Calls/SMS and 3G and 2G Data.The revised plan details are tabulated below. Also is it necessary to fax my complain to Mr Aloke Kaul as i have already registered my grievance.